I hope you have a thing for peaches ;). These muffins just make me smile. Not only are they a vision come true, but they’re also the first thing I whipped up with my new oven. I can’t even tell you how excited I was when Adam and I finished hauling our old appliances out of our house and switched them out with the new ones this past weekend. There were several problems with our dishwasher and stove in particular, but I didn’t care. As long as I was able to cook and bake to my heart’s content, I was happy as can be. But I am not going to deny that the new ones are NICE. We didn’t get anything too fancy, but to me the new appliances might as well be the most expensive ones around! Also, you may have noticed how I mentioned that just the two of us took care of the removal and installation. It was a spur of the moment decision and quite a fun way to bond as a couple. How many people can say that they hauled two fridges, two dishwashers and two stoves and two microwaves up and down the stairs and ended up having the best time? Our hard work definitely deserved a sweet reward though. These muffins were proof that all the hard work paid off. But I bet they taste just as delicious no matter what kind of an oven you have to work with – as long as its in working condition, ha! 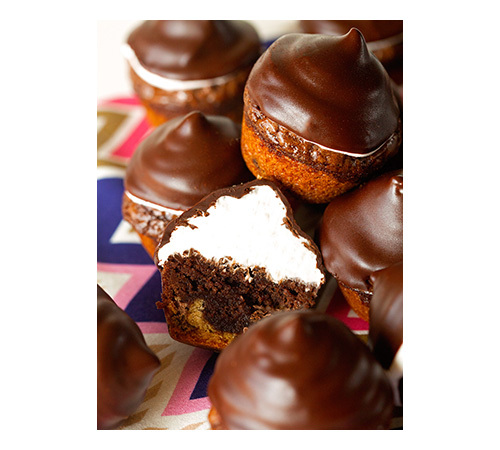 These muffins will basically remind you of biting into a sweet roll. I actually adapted them from this recipe I made a couple months back. You basically follow the steps of making regular sweet rolls, but instead of setting them next to each other in a baking pan, you place each slice into a muffin liner and top each individual one with the most delicious crumble topping and finish them with the glaze. I made sure to explain everything in detail below. 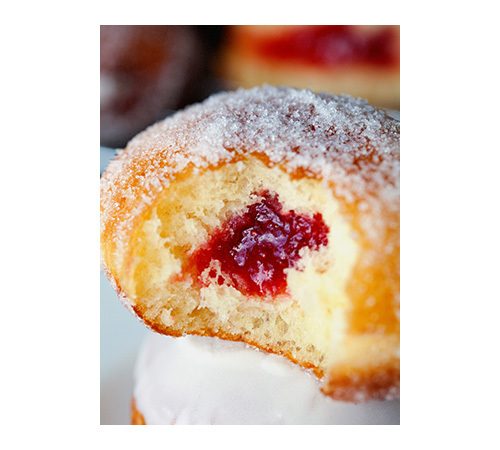 The texture is exactly like the light and fluffy goodness we all love so much in a sweet roll. But this version is much easier to eat, looks adorable and is great for storing. 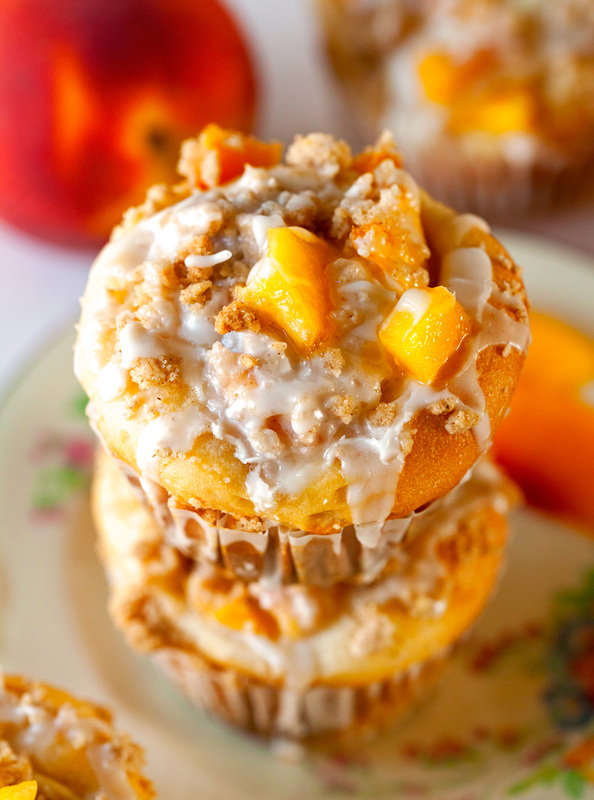 They freeze just as well as regular muffins and who wouldn’t love keeping these on hand for a quick breakfast on the go? 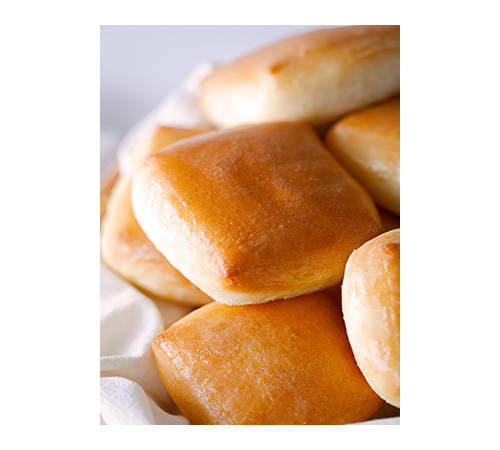 I am certainly having a craving for any and everything containing the word roll lately, especially when it comes to Mondays. Last Monday I made you Itty Bitty Cinnamon Rolls and then this happened today. I hope you don’t mind – I can’t help myself. I think it’s the secret to a great week. Happy Monday, everyone! Thoroughly grease muffin pan or line with 18 muffin liners. 2. In a small bowl, combine peaches, 3 tablespoons of sugar, and cornstarch. Set aside. 3. Roll out your dough until it measures 12 x 14 inches (rectangular shape). Spread peach filling on top. Beginning with the longer side that’s closest to you, roll dough into a log. Pinch edges closed and cut into 18 equal pieces. Place each piece (with the spiral side facing up) into one liner and cover with a clean kitchen towel. If they don’t fit, fold the ends together to make a “C” shape. The pieces should come to about the top of the liners. Let rise in a warm place for 30-60 minutes (or until double in size). Meanwhile, preheat the oven to 350 degrees F and prepare the crumble topping. Mix together the butter, When the muffins have finished rising, prepare the crumb topping. 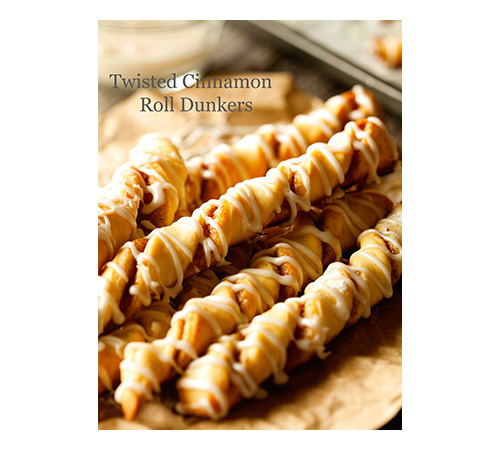 Mix together softened butter, sugars, cinnamon, and flour. After combining the ingredients, I usually use my fingers to work the butter into the remaining ingredients until coarse crumbs form. If topping appears to be too wet, add another tablespoon of flour. Top each muffin with evenly with the crumb topping and bake them for 20 minutes or until the tops are golden brown. Remove muffins from the baking pan and place on a wire rack to cool slightly. 4. While the muffins are cooling, prepare the glaze by whisking the confectioners' sugar and heavy cream together. 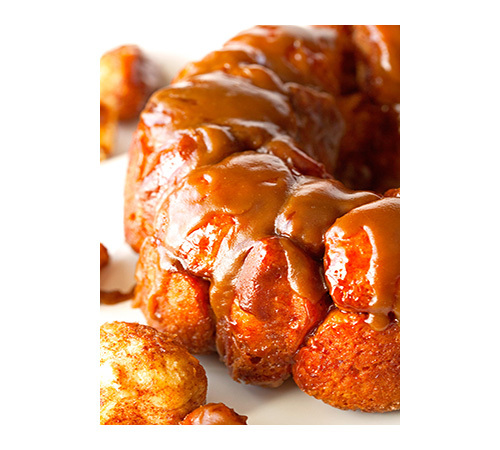 Using a fork, drizzle glaze over each muffin and enjoy while still warm. Muffins will keep up to 5 days stored in an airtight container in the fridge or up to 1 month in the freezer. These muffins would definitely make my Monday better! So gorgeous, Kathi! I’m literally in awe of these. 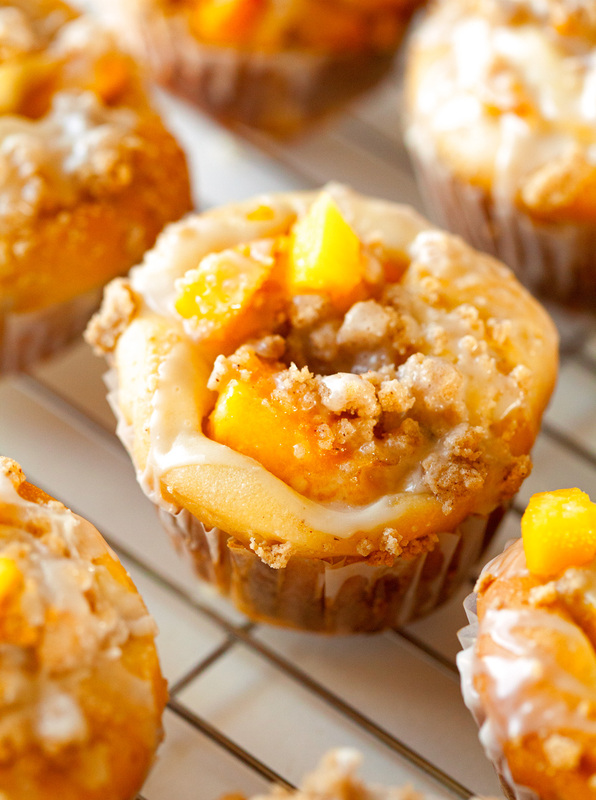 They looks so delicious and full of peachy-goodness! Pinned! If looks could make you gain weight, I would be as big as a house with your goodies. Especially these because I love peaches! My word! These muffins are breathtaking, they look so yummy. 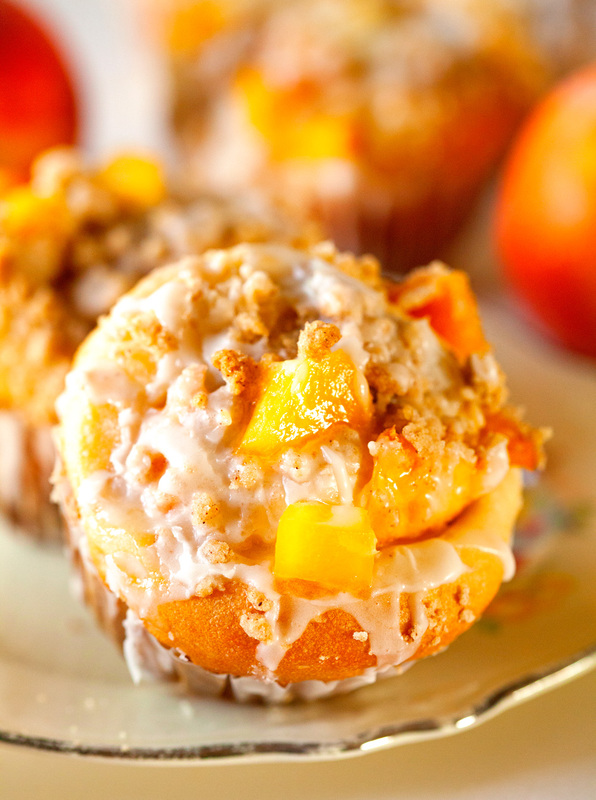 I love peaches and the crumbly muffin tops are calling my name! Looks like your your new oven is working for ya! 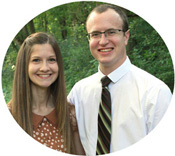 Ummm, you have the best attitude EVER about installing all your appliances! What a nice wife you are! We recently carried our fridge outside to spray paint it black (it was ivory, ick), and even just carrying it 50 feet away was tricky. I can’t imagine taking them up and down stairs! You are a rockstar! And installing them? Bravo! Bet it was worth all the work, nothing like brand new appliances. They’re so clean and shiny and just begging to be broken in. These muffins look amazing! I just bought a big flat of peaches at the farmers market, and can’t get thru them fast enough. This will be a great way to use up the few that are left! 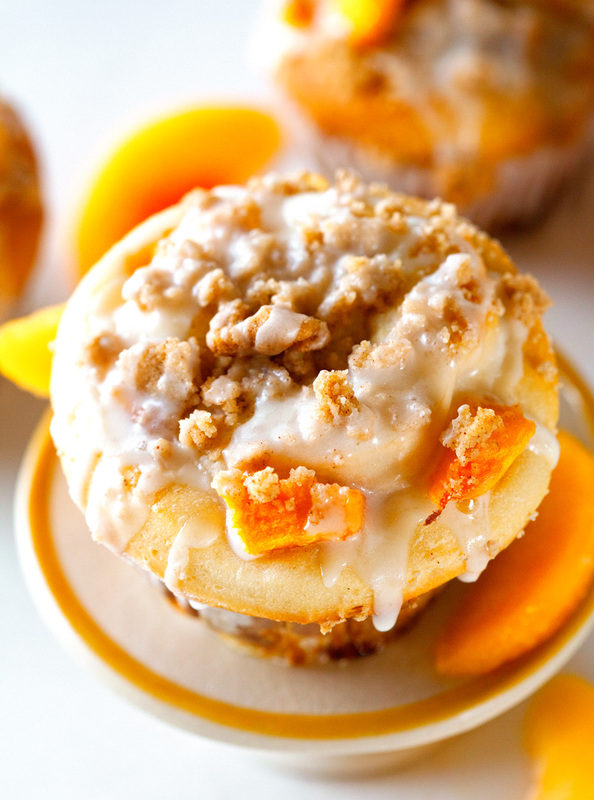 Did you really combine sweet rolls, crumble and muffins into one breakfast/dessert! Holy cow, girl! You are an inspiration to us all! I totally get you on the new appliance thing. It’s the little things in life! 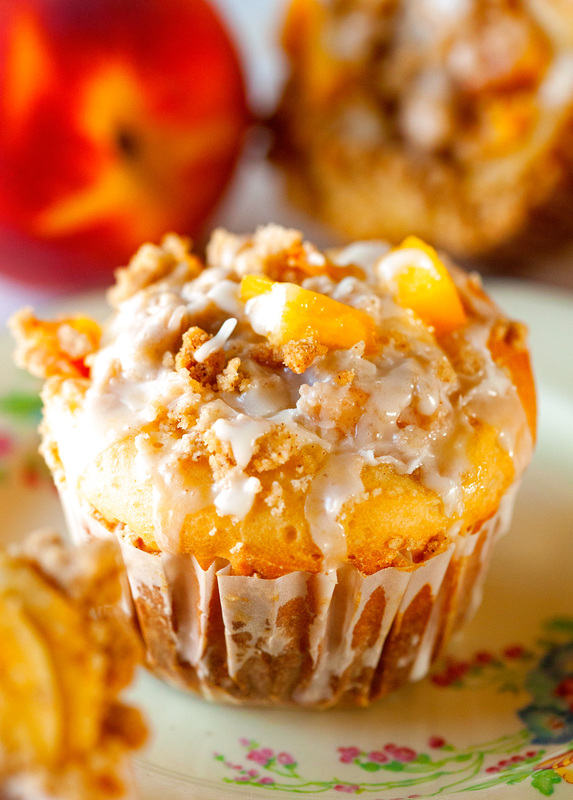 I’m totally taking advantage of the fact that I have 10 peaches in my fruit basket that need to be put to good use by making these muffins! Thanks for sharing! Gah, I am seriously drooling! 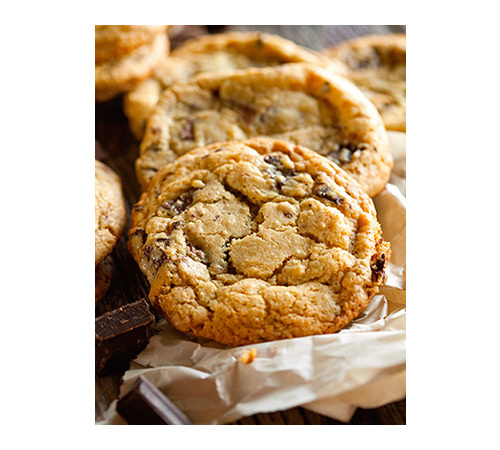 You guys definitely deserve a treat after all that work! I love peaches and haven’t had any yet this summer (why!?). These muffins look just amazing! Ha, I am eating not just one but two peaches at this very moment. 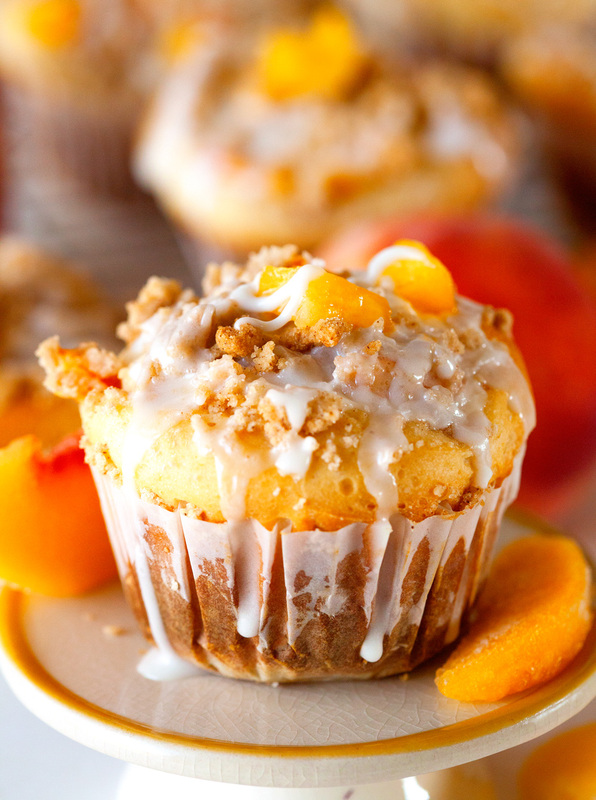 I LOVE peaches and these muffins look incredible. This is a much better start to Monday! 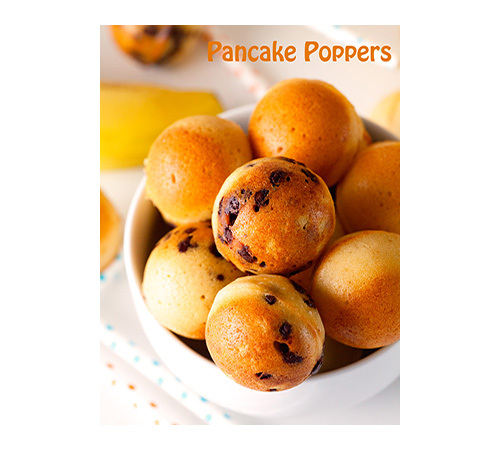 these look great for breakfast! I’m not really even a muffin eater, but girl, I could down a few of these, these look to die for! I seriously could not pin these fast enough! So glad I stumbled by your blog and my sense are on overload from these gorgeously decadent muffins – I swear I can smell them!! These muffins would definitely brighten up any day for me! 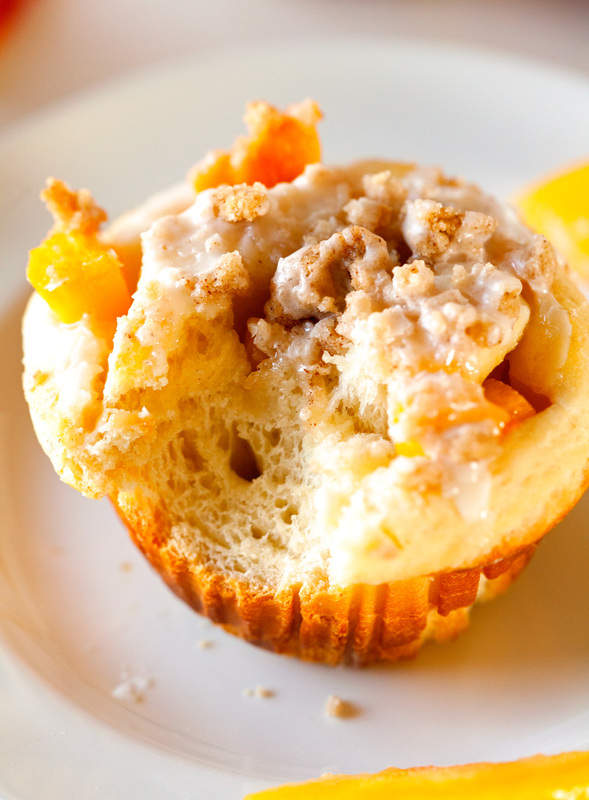 I am a sucker for muffins with crumble and love how much is jam packed into these! These look amazing! I read through the ingredients before I read the directions. No where in the ingredients are raspberries mentioned, yet the directions state spreading the raspberry filling on the dough. I updated the recipe. Thanks for pointing that out. I definitely have a thing for peaches and this recipe looks awesome. Thanks! I almost always use frozen ones because fresh peaches tend to get too watery and don’t hold their shape as well. These just came out of the oven and smell amazing! I will absolutely be sampling these after the drizzle goes on of course! I’m pretty excited about it! LOL. They sound absolutely delicious! How long will they keep? I’m planning on baking on friday night for saturday evening. As the dough seems bread-like im guessing they’ll dry out pretty fast… Thank you for your answer! 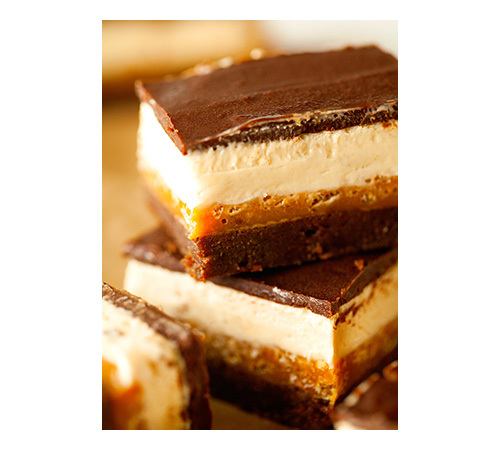 Oh my goodness, these look delicious! Have you ever tried throwing in some freeze dried peaches, too? I love baking with freeze dried fruit to add a seriously fruity punch without affecting the texture of the baked good.